For 2017 WCS has begun working with downstream partners to recycle textile waste. Waste Control now offers collection services as well as drop-off of textiles to our North Van Recycling Depot. Used clothing, linens, & shoes will be collected by WCS and then baled and transported to a local sorting facility. Items of all conditions are accepted – including those that are not wearable anymore. At the textile sorting facility wearable items will be re-sold & distributed and items not in condition to be re-worn will be recycled. Within the industry, a textile sorting facility is termed a ‘grading facility’ and this is where items are separated into piles from high to low quality. Items that are still wearable are deemed ‘high quality’ and are subsequently sold and exported worldwide – often to less developed countries. Mid-range quality textiles become wiping cloths used in a variety of industries and then low quality materials are processed into items like carpet padding & insulation. A 2015 waste analysis by Metro Vancouver showed the average person in the region throws out 19 kilograms, or 42 pounds, of textiles every year. Waste Control Services is committed to being an environmental leader and is always looking for ways to help our customers and community be more sustainable. Textile recycling is an effective way to reduce one’s environmental impact. Did you know that? 700 gallons of water (enough to fill 22 bath tubs) are used to manufacture a single t-shirt! 1/3 pound of pesticides and herbicides are used to grow the cotton used in just one t-shirt! When a t-shirt decomposes it releases methane. Methane is a greenhouse gas which produces a warming effect 25 times more than carbon dioxide and thus it contributes substantially to climate change. If all North Americans recycled just one t-shirt, 210 billion gallons of water would be saved and 1 million pounds of CO2 would be eliminated! To further enhance WCS’s community waste reduction initiatives the public is now welcome to drop-off textiles through our Beyond the Blue Box Recycling Depot. If your business or residential building is interested in an ongoing textile recycling pick-up service give us a call at 604-987-1493 or get a quote through our online form. This is amazing news. I love that there is a place to bring end of life clothing instead of throwing it away. I went to the North Van depot today and there was no area for non wearables. Only charity bins for wearable clothing. Help! I think you may have mistaken the North Vancouver Recycling Depot & Transfer Station at 30 Riverside Drive as our Depot. We are not affiliated with any regional or municipally funded depots such as that one. Do you have other drop off areas in the lower mainland? To update your billing info, please call our AR Department at 604-986-9777 ext #237 or email them at ar@wastecontrolservices.com. Can I drop off old towels and sheets for recycling? 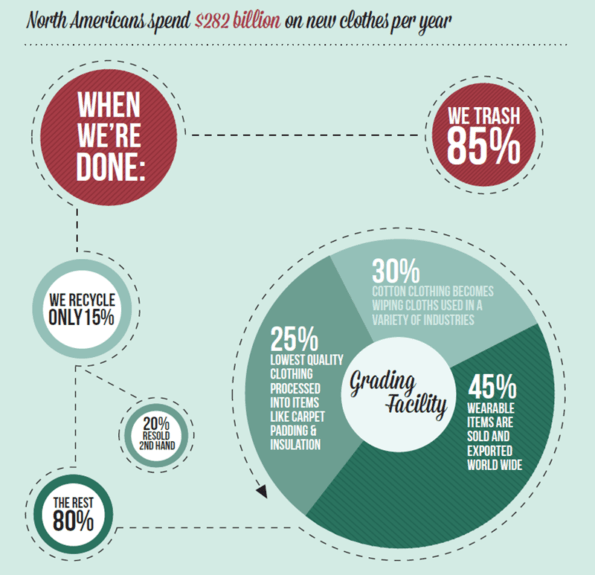 Does unusable, unwearable clothes get recycled locally? Or is it shipped out of country? It will depend on the item and also the market demand for the material. Some are made into wiping cloths/ rags used in a variety of industries in North America and some is sold to overseas buyers. Our recycling program is set-up through a broker called Bank & Vogue (https://www.bankvogue.com/). Bank & Vogue organize what happens to the material and where it goes. Recently they have been in the news as they now have an agreement with BC Return-It depots to recycle clothing as a pilot: https://globalnews.ca/news/4991119/vancouver-clothing-return-it-donation/. I use fabric for sewing and quilting and have lots of scrap of fabrics left over. Does WCS take fabric scraps or just clothing and towels and sheets?